Welcome to Total Safety Signs, where we pride ourselves in helping others make their area a more safe and healthy environment. 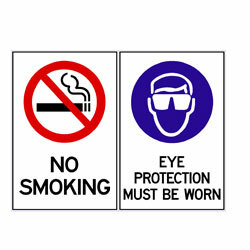 Total Safety Signs manufactures and installs an extensive range of safety signs and products. Our prices are competitive, and our service is outstanding! We supply standard signs or we can provide you with your customised signage requirements. 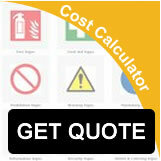 There are thousands of stock safety signs, parking signs, and traffic signs on this site to choose from. Each sign is available in a variety of different sizes and materials to match your specific application or requirements. If you can’t find the exact sign you require or you wish to customise a stock item with you trade mark or name we can easily create or modify your very own signage at a minimal cost. Total Safety Signs is a fully functional e-commerce site designed for you to easily locate the signs you require, then with the convenience of on-line shopping from your computer at your office, site or even at home, we've made it simple for you to order and pay. If you require a sign NOW!, order on-line or give us a call, and we will endeavor to meet your needs. Thank you for considering Total Safety Signs! I need my signs in a hurry, can I pick them up myself? Yes you can purchase or collect signs from our premises, which is open between 8.30am and 5.00pm. Call our sales team to check stock availability Tel (02) 9756 0822. If I have looked through your online shop and can’t find the sign I am looking for, what should I do next? Call our sales team as we have thousands sign products and you can use their knowledge to find your sign. We can design and provide a quote for a complete custom made sign. I can’t find the sign I want on your site, but I have seen it on another site, can you help me? Yes. Send us the type of sign and any codes and we will endeavor to supply you the sign you have seen or recommend another type that will fit your needs. My company is re-locating to a new building, how do I know if I have the right health & safety signs? Legislation can be complicated one of our Team would be happy to talk you through your requirements we can also arrange a Site Survey to make sure your signage needs are fully covered. If I place an order today when will I get my signs? On line stock item orders purchased before 11.00am are dispatched and delivered next day. Public Holidays excluded. Go to our site for more information on the services available. No, you can order as little as you need, there is however a packing and delivery charge of $15.00 for all standard orders under $100.